At age 25, John Legg is two generations removed from the height of the U.S. civil rights movement. But he has long been drawn to the era’s iconic imagery. The stunning composition of many of the black and white photos illustrating the turbulent time of the 1950s and ‘60s appeals to his artistic side while fostering his scholarly interests. So Legg, a Middle Georgia State University history major and freelance photographer, decided to shoot a series of images that mirrors the vintage style and serves as a Black History Month tribute. Using a fellow MGA history major as a model, Legg spent half a day in early February shooting in various locations in downtown Macon, including the basement of a bar, an alleyway and a parking garage. He did not try to recreate specific events captured in civil rights era photographs, instead looking to mimic the grain, light and shadow that characterize so many of those images. As the model, DeMarcus Beckham dressed the part, first in the clothes of a blue-collar workingman, then donning weekend casual. He finished up wearing a black suit and tie with a white shirt, looking somewhat like a young Malcolm X. After Legg shared the resulting images with a Facebook group called LooksLikeFilm, which promotes digital photography that captures “the soul of analog film,” the reaction stunned him. The Statement, Middle Georgia State’s student newspaper, published nine of the photos in its February 17 edition. Legg is a mostly self-taught photographer who got his start several years ago when a relative needed somebody to take publicity shots for his band. That eventually led to Legg’s freelance career specializing in photographing musical acts on stage and behind the scenes. He also travels around the Southeast and sometimes beyond shooting engagement photos and weddings. His website houses his impressive portfolios, although none has quite garnered the same attention as his homage to civil rights era imagery. “A lot of people have told me this is the best collection of photos I’ve ever taken,” he said. Beckham, who hopes to establish a career as a political lobbyist, said older relatives have told him stories about their struggles during the segregation era. Serving as Legg’s model for the photo series was an honor. “I’m so proud to have been a part of it,” he said. As for Legg, he plans to continue threading photography through his career dreams, which include working for the National Park Service. Eventually, he hopes to earn a Ph.D in history and become a college professor. Editor’s Note: Legg’s series of photos featuring Beckham is at http://www.johnleggphotography.com/page-db. 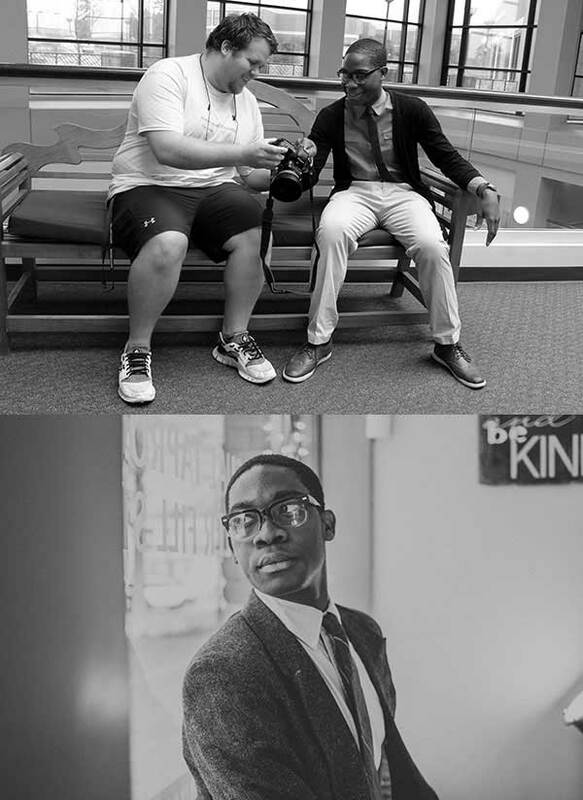 Photo: John Legg, photographer, and DeMarcus Beckham, model, are both history majors at Middle Georgia State University. On the bottom is one of Legg's photos from the series.